Who can resist Cool Whip, pudding, bananas, and vanilla wafers? I know that I can’t. Granted, my family and I are suckers for sweet treats but c’mon, this dessert is simply dreamy. And guess what? Even though there is sugar in this southern banana pudding, it’s still a healthier option than some other desserts. It’s a win across the board in my book. Beat pudding mixes and milk in medium saucepan with whisk until blended. Beat egg yolks in small bowl until blended. Gradually stir into milk mixture. Bring to full rolling boil on medium heat, stirring constantly. Remove from heat. Arrange layer of wafers on bottom and up side of 2-qt. baking dish. Top with layers of 1/3 of the pudding and half the banana slices. Repeat layers; cover with remaining pudding. Beat egg whites and cream of tartar in medium bowl with mixer on high speed until foamy. Gradually beat in sugar until stiff peaks form. Spread over pudding, sealing to edge of dish. Bake 15 min. or until meringue is browned. Cool. 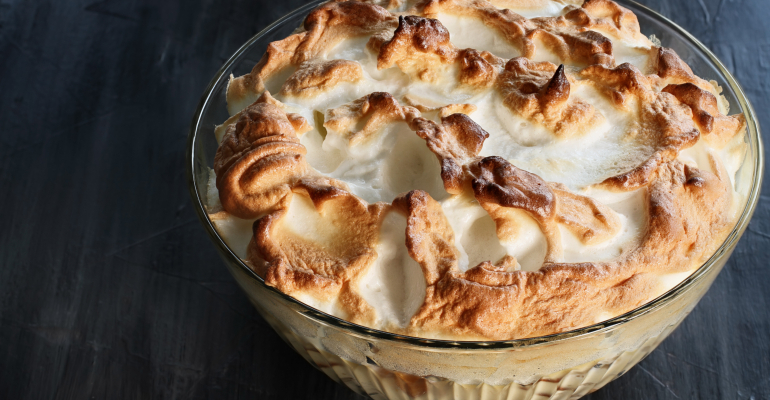 Quick Tip: This southern banana pudding recipe is very easy to double.